Freezing Clothes to Remove Odor – Does It Work? Your freezer is much more than just a device that keeps your foo fresh for as long as possible. Noooooo. The freezer can do so much more. So why limit your devices? One of the hard-to-imagine-possible uses of the freezer is to remove odors from clothes. And do that without washing. So, how does freezing clothes to remove odor works? Before we get to that aspect, it is worth noting that this method is only for those who are not afraid of trying new things. Try it once, and see how it goes. The method works perfectly for workout clothes that do not require ironing. All you need is your workout clothes to smell fresh. So, instead of stuffing load after load of laundry in your washer, try using the freezer. Let your freezer do the heavy lifting. Why do my clothes smell? If you want to start freezing clothes to remove odor, you need to understand the entire process. And more importantly, how your freezer helps, and why your clothes smell. The main reason clothes smell is because of bacteria. If there are no stains on your clothes from food, residue, oils, dirt, and so on, the only reason they produce odor is bacteria. You wonder why your jeans smell like mildew, there is your answer. How to use the freezer? What might sound like a complex progress, it is rather a simple task. All you have to do is roll your clothes, put them in a Ziploc bag, and then put the bag in the freezer. The cold from the freezer will destroy any bacteria in your jeans or workout clothes. And there will be no bad scent left behind. Why put one or two gym shirts in the washer? After coming back from a workout, put your shirts in the freezer, and they are good to go for the next workout. Just make sure you warm your family first, so they do not think you are insane. Let your clothes stay in the freezer for a couple of hours. And bonus points: since the freezer is already running, you are basically conserving energy. The freezer works not only for removing odors from your clothes, but for other clothing tricks. You want your soft and fuzzy sweater to stop leaving clumps of fur behind? Use the freezer to stop shedding woes. Put the sweater in a bag, and then in the freezer. The cold temperature will draw the fibers together, lock them in place, and prevent future shedding. Who doesn’t hate when their favorite jeans go from dark and deep blue, to just sad blue in the span of a few washes. Washing your jeans in the washer can make them fade. As mentioned previously, you can clean them in the freezer, and prevent them from fading and losing color. Once you buy new shoes, endless blister pain comes with that. It is like every time you slide your feet in a brand new pair of shoes, you can expect some pain. How to prevent it? Just toss the newest pair of shoes in the freezer. The cold temperature will break in the tight shoes. Make sure to fill some plastic bags with water and stuff them into the shoes before putting them in the freezer. Speaking of workout clothes, the freezer can help you extend the life of your favorite tights. No matter if they are new or old, they can rip incredibly easily. But a dose of intense cold can strengthen the filmsy material. When you get new tights, the first thing to do is run them under water, squeeze the excess fluid out, and then stick them in the freezer. Warm them up to room temperature the next day, and pull them on. 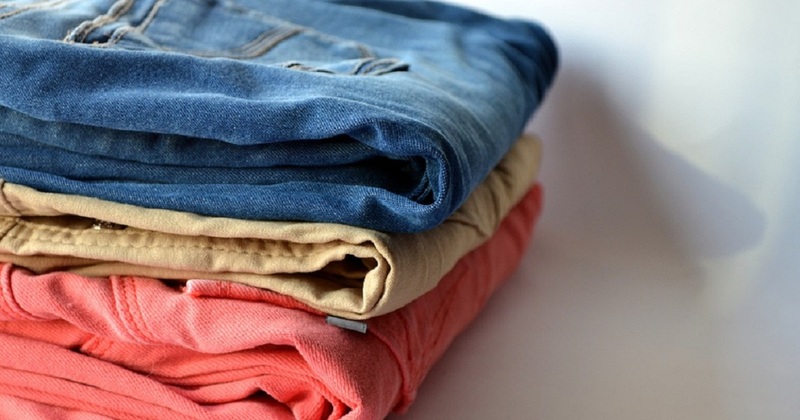 Only one round is enough to strengthen the fibers of your clothes. This is an unpleasant situation in which anyone can fall into. You might sit or fall into a sticky piece of gum. It happens, and that doesn’t mean you have to throw out your clothes when it does. Just use your freezer. Gum adheres strongly to the fabric of the clothing. But when you put your clothes in the freezer, the gum will loosen up, and you can remove it easily.